WASHINGTON— Dozens of space exploration advocates sent Congress an open letter Tuesdaysupporting President Obama's plan to develop commercial spaceflight and callingfor even greater funding for NASA. Obama'sbudget proposal has roiled Congress because he proposed ending NASA's Constellationprogram, aimed at returning people to the moon. Hewould scrap NASA's Ares rocket, which also could have deliveredastronauts to the International Space Station, and instead wants to shift responsibility forlaunching astronauts to the station to the private sector. Obama proposedadding an extra $6 billion to NASA's budget to help do that. Thereliance on commercial rockets has stirred up opposition from space heavyweights such as NeilArmstrong, the first person to walk on the moon, and John Glenn, the firstAmerican to orbit the Earth, who have called it premature. Morethan 50 space officials, from industry leaders to former astronauts, arguedback Tuesday. "Wespecifically wish to express our concern that the commercial crew to spacestation program is sometimes seen as optional or too risky to America's future in space, but nothing could be further from the truth,"they wrote. Theletter urged lawmakers to keep the $6 billion increase that Obama proposed forcommercial spaceflight ? and to "accelerate the pace and funding of NASA'shuman space exploration projects beyond Earth orbit." "Thesetwin pillars of human spaceflight are each crucial to the long-term health ofour nation's space program," the letter read. Signatoriesinclude Elon Musk, founder of SpaceX, and former astronauts such as OwenGarriott and Jim Voss. FormerNASA officials on the letter include Jim Kennedy, former director of KennedySpace Center, and Scott Hubbard, former director of NASA Ames Research Centerin California. 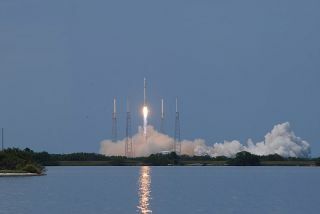 Separately,the company that merged the Atlasand Delta rocket families also joined the advocacy group that supports Obama's commercial spaceflight plan, the Commercial Spaceflight Federation. Aslawmakers squabble over Obama's shift from the Ares rocket to commercialrockets, key leaders have questioned whether the space agency deserves the $6billion increase that Obama proposed. HouseSpeaker Nancy Pelosi, D-Calif., and Sen. John Rockefeller, a West Virginia Democratwho heads the Senate science committee, have each questioned the funding boostwhen weighed against other domestic spending priorities. Thebudget debate will likely remain unresolved for months, as lawmakers strugglefirst with how much to spend overall in this election year's budget and thendecide how much each agency should receive. Committee votes on policy couldbegin in late June. Publishedunder license from FLORIDA TODAY. Copyright © 2010 FLORIDA TODAY. No portion ofthis material may be reproduced in any way without the written consent of FLORIDA TODAY.